Here's an excuse to make yourself feel like a queen. The piece is exquisite- it's comfortable to wear- and it's affordable. What more do you want!? Seriously- the necklace is quite luxurious, yet you could wear it anytime. Let's look at the artful construction. Each diamond is set into it's own millgrained link. Then one .15, and one .11ct on each side. At that point the graduation becomes less severe. 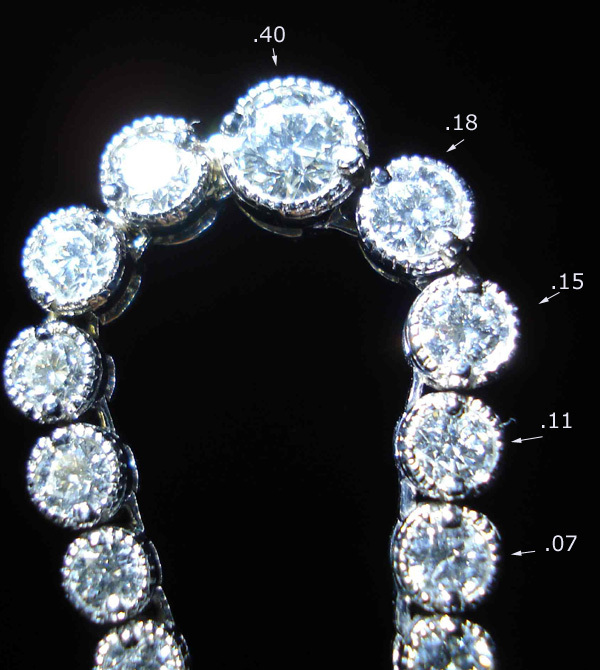 3 four pointers- followed by 60 .025 diamonds to the diamond studded clasp. Of course no matter how well you set poorly cut diamonds, you're going to have a cruddy finished product. We use our own grading system. It starts with cut. There's only two grades "Amazing!" and "REJECT"
See, if it's not really well cut we won't use it- regardless of the color and clarity. These particular diamonds are carefully selected SI diamonds. That's the reason it's not $7995. I can't repeat this enough- a well cut SI can look every bit as lively and sparkly as an Internally Flawless Diamond. These do.